Why do big corporations often do things that appear to disregard the feelings or even the existence of people who consider themselves to be stakeholders in that company’s given business? It’s a convenient narrative that this is because that’s what big corporations do. They are, by nature, money-hungry and heartless. But I think there’s another reason, one which those corporations would never admit because corporations are committed to talking like corporations. That is: sometimes being heartless is the only way to get things done. 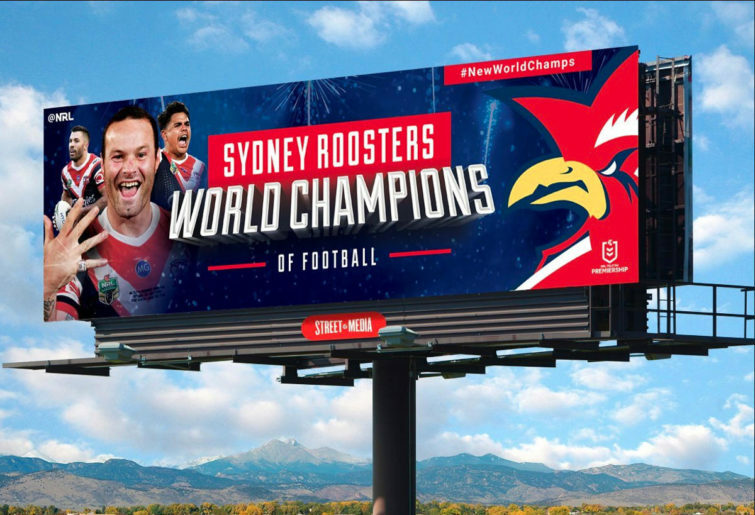 I am saying this in reference to the NRL’s billboard in Atlanta, advertising the Sydney Roosters as the “World Champions Of Football”. I have sympathy for the all the viewpoints expressed by those who have criticised the campaign. In reading the posts on social media, I’ve more than once had second and third thoughts about my initial praise for the signs. I appreciate the Atlanta Rhinos felt they should have known such a campaign was going to be held in their own town and that they could have helped spread the word to local media about who the Sydney Roosters are. I understand the Americans who say it is exactly the wrong approach to mock Americans’ propensity to call domestic winners ‘world champions’ on giant billboards in their own cities. I agree with the British rugby league fans who say the current world champions are, in fact, the Melbourne Storm and that Wigan and the Roosters will play off for the title at DW Stadium just under three weeks from now. But sometimes if you have a big idea, you just don’t give a rat’s about trampling on the sensibilities of insiders in the hope of reaching a whole lot out outsiders. But now we know even that was not the intention. We now know, as of half a day ago, that the billboards are in fact a big prop – think, bigger than Aaron Woods – in a rather expensive advertising campaign. The NRL released a video yesterday in which it asked people on the streets of Atlanta what it thought of the billboard. If you can call your winners world champions, then why can’t we? So the billboards weren’t there to reach Americans at all. They were there to be filmed by Australians, who then asked for reactions from people who hadn’t even noticed them (hence the tablet in the vox pops) and shown back in Australia. In that case, it doesn’t matter if Americans and Brits are insulted by them. Despite the expense, the entire exercise is aimed at the Australian domestic market. (Also, “world champions of football” is a direct piss-take on the NFL winners being called world champions. If they win of February 17, even Wigan wouldn’t call themselves “world champions of football” – so the WCC really is irrelevant here). In conclusion, despite all the dissenting voices, which I respect, I’m still a fan of those billboards and this marketing strategy. And that brings us to the way the season has been ushered in in England: with the news on the eve of the Super League opener that would-be ‘world champions of football’ Wigan have been docked two competition points for a salary cap breach two years ago totalling just £14,700. This means they’ll start the season on minus two against St Helens on Friday morning, Australian time. (That might also be the temperature). Some context: Super League has broken away from the governing body, the Rugby Football League, this year – insomuch as it can ‘break away’. Super League is only a marketing body. It has poached a lot of the RFL’s staff to market itself better. Sure, its clubs insisted on golden point and a shot clock and all that this year but it relies on the RFL for referees, tribunals, integration with the rest of the game, and the RFL negotiated the TV deal. If the next TV deal goes down and lower division clubs are cut off financially, perhaps Super League will have to run its own referees department, its own disciplinary and salary cap tribunal, its own player registration and clearance system, and employ people who were previously volunteers. And it would soon find itself destitute. So in case the likes of new Super League CEO Robert Elstone is getting ahead of himself, it was a timely – if co-incidental, not accusing anyone of grandstanding, y’understand – reminder that the governing body can still take the wind out of the most billowy of sails with the stroke of a pen.